Upon arrival in Venice, cruise along the Grand Canal by private motor launch, past ornate and gilded palazzos and churches to your superbly located hotel for a two night stay. Tonight join your fellow guests for a welcome drink with your Tour Director. Start your day with a guided tour of Ljubljana, seeing the Opera House, National Museum, Franciscan Church and St. Nicholas Cathedral. The march of time has been a little slower in Dalmatia than elsewhere in Europe. On this beautiful journey you’ll discover unique glimpses into the past. With its many splendid churches, imposing fortress towns, and the rugged natural scenery that still dominates the vast open countryside, a trip to Dalmatia is a unique opportunity to appreciate some of the magnificence that has been lost elsewhere. From seaside communities like Opatija to ancient walled towns like Dubrovnik, you’ll find wonder aplenty. 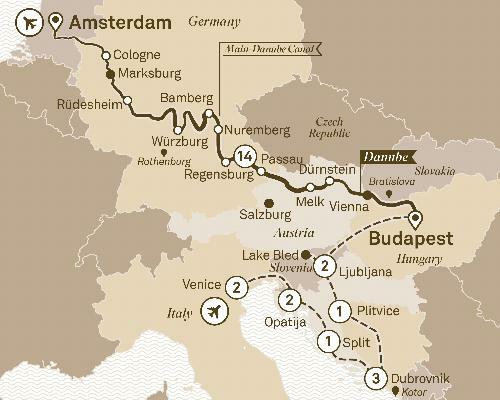 It’s also the perfect way to start a luxury trip along Europe’s most beautiful waterways.